River of Sky through Autumn Maple Leaves, Michigan’s Upper Peninsula. October 9, 1998. 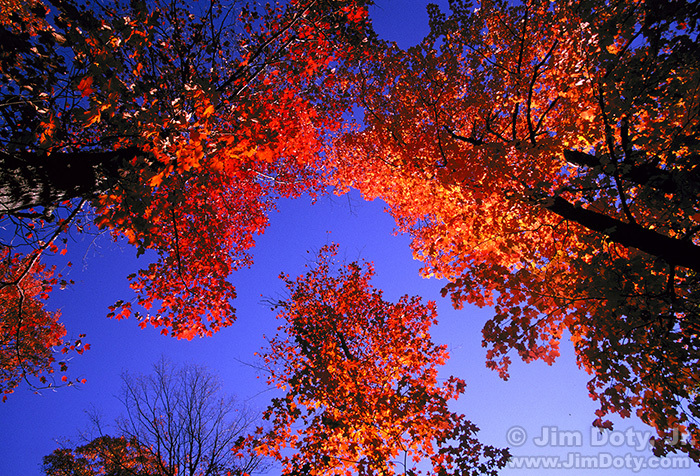 My favorite photo for today is also one of my all time favorite fall color images. I was wandering Michigan’s Upper Peninsula on a fall color photography trip and I stopped at a roadside park just south of Germfask, Michigan for a picnic lunch. For some reason I looked straight up and I couldn’t believe my good photographic fortune. Straight overhead there was a “river of sky” making its way through gorgeous autumn maple leaves. I was blown away by the color. I grabbed my tripod and camera, set them up on the picnic table, and shot straight up. The Fuji Velvia slide film captured the colors beautifully. 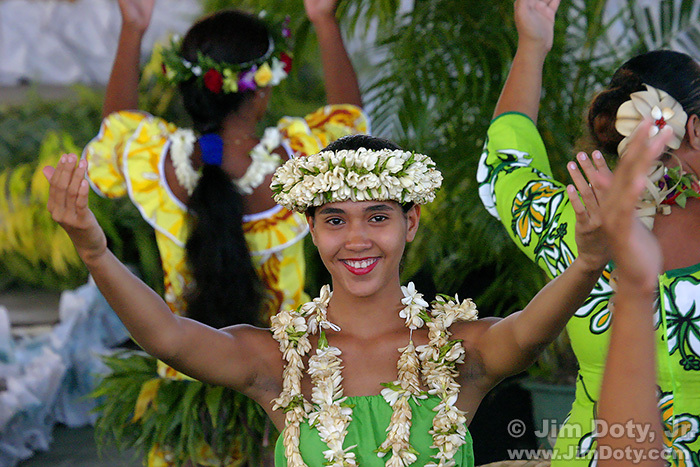 Dancer, Tahiti. October 9, 2004. My second place image for October 9 was captured in Tahiti. My wife, her sister, and my brother-in-law, and I were driving along for a morning of exploration and heard music. We stopped and found a “Christian Celebration in Music and Dance” going on, and it was open to the public. We found four seats in a good location and I started grabbing images of dancers of all ages. This particular dancer caught my eye and she made eye contact for quite a while. My sister-in-law said “I think she is flirting with you.” I agreed. I got several nice images of her as well as other dancers. This is one of my favorites. 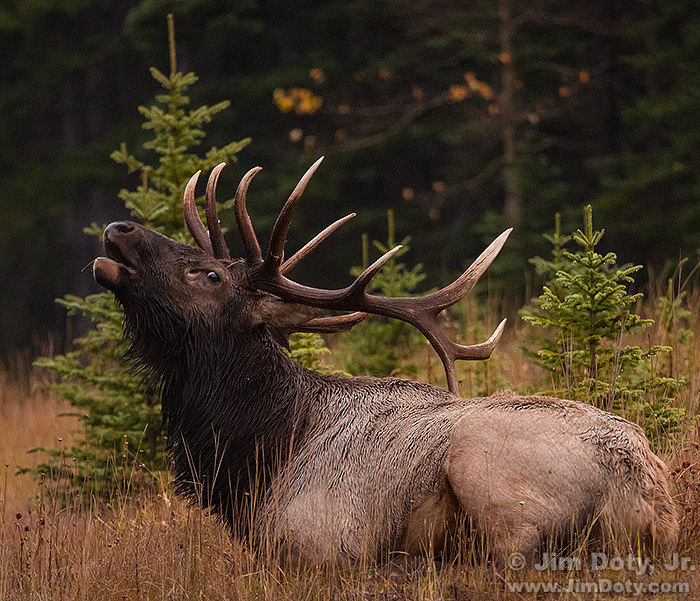 Bull Elk Bugling, Banff National Park. October 9, 2012. October 9 is also during the time I was in Banff National Park. As you know from past posts on my trip to Banff, much of the time I was there it was cloudy and rainy. October 9 was no exception. Looking for something to photograph on a cloudy day, I came around a bend in the road and found this big boy. I put my telephoto lens out the car window, steadied it on the window ledge, and caught this image of him bugling. 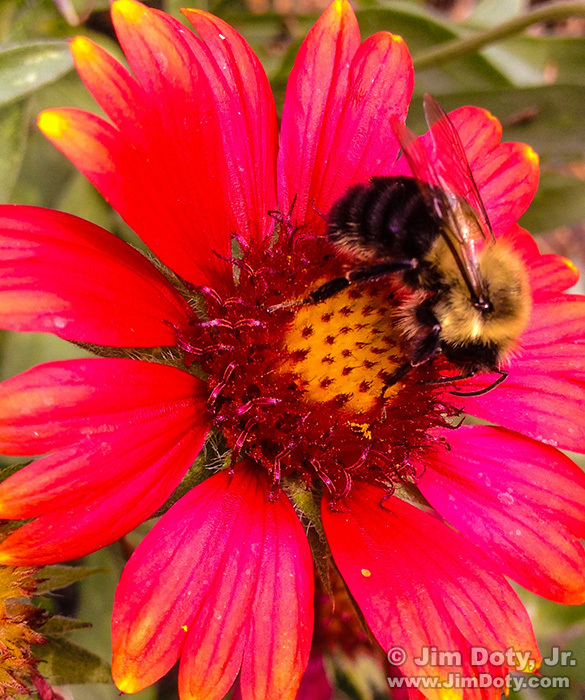 Bee on a Blanket Flower. Columbus, Ohio. October 9, 2015. My fourth place image for October 9 happened as a result of a phone call. A writer with the Akron Beacon Journal wanted to interview me for her newspaper. She was writing an article on how to do garden photography with a camera phone. So I went outside and started taking pictures in my garden with my iPhone. I snapped this photo and emailed it to her. It ended up being one of the headline photos for her article. More about that when I do my post for October 16.